managers have lost sleep over the thought of an employee device, loaded with sensitive company data, falling into the wrong hands. Lookout commissioned Forrester Consulting to conduct a national survey of IT managers in the Fall of 2013 that uncovered substantial security concerns related to mobile devices, especially around malware and data loss. 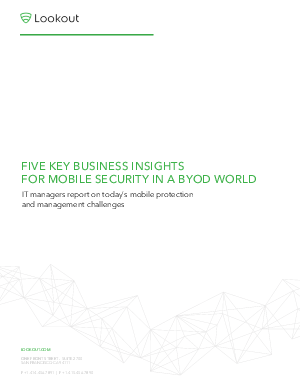 Ultimately, the survey revealed that IT managers do not believe existing security solutions can adequately address the mobile security challenges faced by businesses today.